January 28, 2019 12:10 pm. Frankie Lor is shaking things up around Sha Tin. The second season handler landed his initial Group 1 last month and this afternoon (Sunday, 27 January) the former jockey stamped his mark on the Four-Year-Old Classic Series with a first Hong Kong Classic Mile success. “I sat on him last week and certainly wouldn’t have expected him to show that sort of turn-of-foot over this distance against this opposition,” Bowman said. “He worked like he’d run well at a mile but I had my doubts that he could win at this class at the mile. Furore’s win arrived one year after Lor’s Morethanlucky had placed third in the Classic Series’ opening gambit. The then-rookie trainer received warm recognition for that effort, but few could have thought then that the ambitious rising star of the training ranks would arrive at the next edition with the strongest hand in town. The mafoo’s son, who was raised within view of Happy Valley Racecourse, is on a rapid upward trajectory. He ended his debut campaign second in the championship, behind his old master John Size, but having set a new record of wins for a first-season trainer. His ability to secure one of the world’s biggest-name jockeys for Furore – not forgetting Silvestre de Sousa on Dark Dream and Zac Purton on Superich – is, in some measure, evidence of the handler’s rapid rise up the Sha Tin ranks. “The owner suggested we put on a very good jockey, so I thought it must be Ryan Moore or Hugh Bowman and I asked Bowman,” he said. Furore enjoyed a cruising run behind midfield until Bowman shifted his mount into daylight with 300m to race. That move shunted Gold Win sideways and caused a domino effect that rippled outwards and into the wide-running Dark Dream who was shoved off balance. “He just got knocked out twice, I’ve come with a run and the horse on the inside moved out and cost me momentum,” de Sousa said. Lor’s Mission Tycoon out-ran his rating of 84 to edge second by a nose. “We had a good draw (1) and so we easily got a good position. I waited for a clear run so he saved a lot of petrol for the end and he ran very well,” jockey Leung said. Ka Ying Star had sprinted clear of Furore to win his lead-up run but was no match for his rival this time. The Tony Cruz-trained bay crossed the field from gate 14 and led the way but ran out of steam in the closing stages. Earlier on the card, the Purton-ridden G1 winner Exultant gave Cruz his 1,200th career win as a trainer with an impressive victory in the G3 Centenary Vase Handicap (1800m). 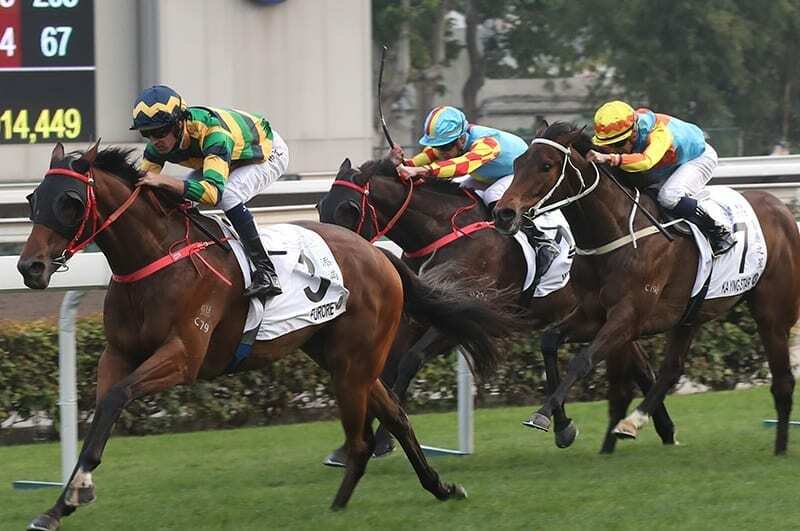 “In Class 2, carrying top-weight of 133(lb), it’s really hard, especially in Hong Kong,” trainer Danny Shum said of the 1.2 favourite’s performance.